Real Action Paintball is proud to invite you to a new kind of scenario game - one where real military and police operators will train you and evaluate your skills ahead of deployment into this springtime's hottest scenario. That's right: you earn platoon leadership and game commanding roles based on your performance…while learning real-world skills straight from the professionals. 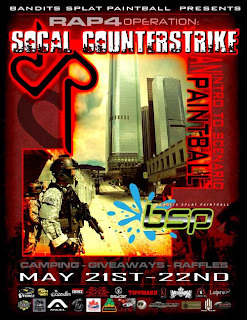 "SoCal Counterstrike" will unfold this May 21st-22nd at Jungle Island Paintball near Lake Elsinore, California. With 15 dedicated paintball fields covering CQB, compound assault, and open terrain maneuvers, this premier SoCal facility is set up to host a mil-sim scenario like you've never seen before. Real military vehicles will be onsite to add to the experience; camping is available and highly encouraged; basic entry to the event is only $40! The training begins on Saturday morning as players divide into four platoons: Alpha, Bravo, Charlie, and Delta. Each platoon starts at a different station, where players receive training in four different skill sets. Alpha starts the day with a timed shooting and obstacle course. Bravo starts with close quarters battle and room clearing. Charlie starts with a teamwork and communication clinic. Delta starts with one on one drills and snap shooting. 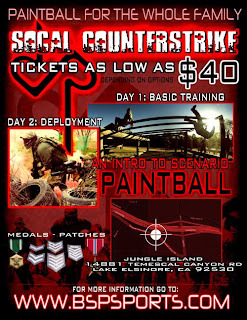 Each station will be manned by police and/or military personnel who will arrange the drills to reflect real world situations and tactics as they apply to paintball. After squads complete their challenges, they rotate to the next station so that every player gets trained, tested, and evaluated on every challenge. Instructors keep track of times, scores, and performance, and the top players from each platoon will receive "commissions" into leadership roles for the SoCal Counterstrike scenario game that begins once the training is over. This way, your performance makes difference. Your experience comes into play. And your skills truly set you apart. The "SoCal Counterstrike" game is a series of tactical challenges that pit the four platoons against each other as they compete as two opposing sides. With two platoons per side, scenario organizer Bandits Splat Paintball has plenty of personnel to challenge with attack and defend missions, recon and recover missions, search and destroy missions…the sorts of real world –inspired action that requires the skills you learn, and tests your cool under fire. See how good you are…and make yourself better at "SoCal Counterstrike" this May 21st-22nd at Jungle Island Paintball! Sounds like fun, I think what would make it or break it for me would how the "training" segment would be handled. If it's treated with levity and a sense of fun it would probably be a blast but, as I've personally experienced, it's easy for event organizers to take that kind of activity too seriously. Not a bad price at all though (except if you have to factor in travel costs if you live outside of California).